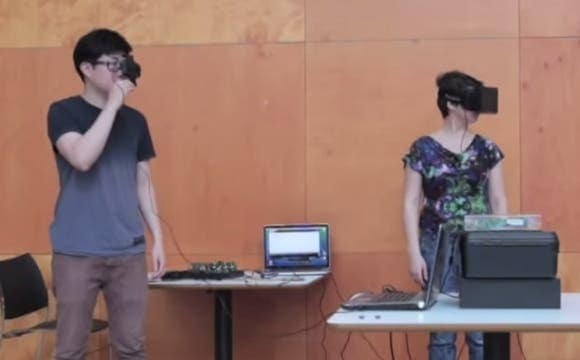 Using an Oculus Rift, a Microsoft Kineckt 3D sensor and electrodes strapped onto key muscles, Yifei Chai, a student at the Imperial College London, devised a system that can be used to control surrogate humans. Basically, the person who wears the Rift virtual reality headset sends a signal that will cause the other person wearing a headmounted, twin-angle camera and electrical stimulators to respond in the same way, essentially controlling him. This is only a prototype and the device is far from being perfect, but this is definitely an interesting first step towards building a new kind of technology. Applications include empathy simulations (put yourself in the shoes of an elder for instance), muscle stimulation for those in recovery following an accident or even better surgical robots. And mind control devices, of course. It’s worth noting that Chai’s system only stimulates 34 arm and shoulder muscles, and that there’s quite a bit of delay in response. Even so, this is a powerful demonstration. Check out the video below for a glimpse.